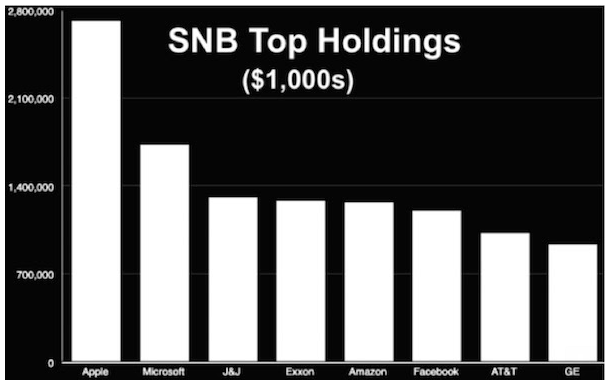 Is The Swiss National Bank The World’s Largest Hedge Fund? But, there’s one central bank that’s has done something even more stunning…The Swiss National Bank. If you can believe it, the Swiss National Bank (SNB) has expanded their balance far more than the Federal Reserve, European Central Bank, or the Bank of Japan. The Federal Reserve’s balance sheet is $4.5 trillion which equates to about 25% of GDP. By comparison, the SNB’s balance sheet is $813 billion which is nearly 125% of the Swiss GDP! Of the $813 billion, $90 billion is invested in equities while the other $670 billion is invested in the Euro and US debt securities. The SNB has certainly had a good year being invested in US Equities especially when you look at where that $90 billion has been invested (shown in the chart below). But, what happens when they want to liquidate their portfolio? The SNB will have a huge hurdle to overcome. If anyone gets a hold of the news that the SNB is liquidating, all the buyers will disappear. It’s not like you can put 19 million shares of Apple on the open market and get filled! If this scheme ends in anything other than a complete catastrophe for the SNB, I would be very surprised, but hey on paper those 2017 gains are HUGE. So, they have that going for them which is nice.